When I was studying at University, I was regularly challenged when it came to reading. Whether it was the subject matter, the ideas, or simply the length, there were many novels, poems and essays that I read that stretched me intellectually. Whilst now that I’ve finished Uni I can choose more books that I want to read for pleasure, I still want to challenge myself with my reading material. This brings me to Colm Tóibín’s novel The Testament of Mary. I had a look through the Man Booker Prize shortlist and I wasn’t drawn to the novel – I didn’t think I could connect to it because of the subject matter. But the other weekend, I stumbled across BBC4’s Review Show: Man Booker Special and the panellists had nothing but praise for the writing. It made me consider my choice not to read the novel purely based on the subject matter and their comments about his writing style really interested me, which made me take a look at the book. The Testament of Mary imagines the lead up to the crucifixion of Jesus through the eyes of his mother, Mary. She is constantly watched and accompanied by two of her son’s disciples who are desperate for information on the events leading up to the crucifixion as they begin to write the gospels, but Mary stays silent. Instead she gives us an honest and unflinching account of the events from her perspective. One of the criticisms of this novel appearing on the Man Booker Prize shortlist is its length – it’s just over 100 pages long. For me, however, the length seems perfect for this novel – Tóibín focussing on one idea creates a novel so tightly structured that it seems to say everything it needs to. Through the hundred pages, Tóibín shows incredible command of language, with each word in this deeply imagined story feeling as if it has been carefully chosen. Each word is weighted and plays its part in creating this rich and atmospheric story. In the Review Show’s Man Booker Prize Special Colm Tóibín said that he knew he was “playing with fire” when it came to writing this novel, but this gave him “a sort of energy in which [he] could put into the sentences so in [Mary’s] ways of speaking in the book, in her voice, there’s a tone which is heightened, which is strung out.” This heightened tone throughout the book gives each page a power that not only would have perhaps been difficult to sustain in a longer book but would have been overpowering for a reader. The heightened and weighted prose throughout brilliantly and powerfully evokes a fearful, doubtful and traumatised woman. The Man Booker Prize website describes the novel as “tender and filled with rage,” and despite the power in the words, there is a delicacy and tenderness which portrays Mary and motherhood. Tóibín’s knowledge that he was “playing with fire” relates to the subject matter of the book. The book humanises Mary, leaving a book that is as much about motherhood as the crucifixion of Jesus. Tóibín’s portrayal of motherhood is one of the startling aspects of the novel – her grief and doubt is not simply about her son and his proclamations but about the fact that her son has moved away from her. It is her grief and fear which completely humanises Mary – her grief feels very real and Tóibín captures this with a startling clarity. She is portrayed as a mother who loves her son deeply, but who is also scared and frightened by what is happening around her. She’s depicted as an ageing woman who is alone, filled with grief for the loss of her husband and son, and doubt about herself, her son and the miracles. It is this take on the story which is so startlingly original and for me, it is this portrayal of Mary which makes the story so real and tangible. 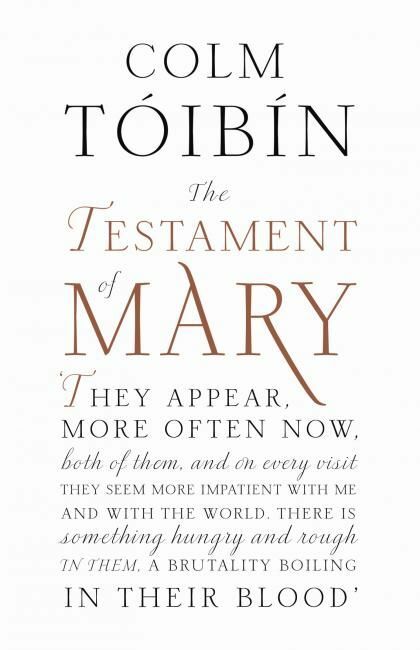 Tóibín’s prose powerfully imagines Mary’s heart-breaking story which resonates long after the final page is turned. His recounting of events from the point of view of someone who doesn’t typically have a voice in literature makes this an innovative and original novel and one I’d highly recommend. On finishing this book, I’m glad that I challenged myself and read something which I initially didn’t think I would connect with – sometimes it goes to show that moving away from your reading comfort zone can mean you finding new books that you love. This was one of my favourite books of last year. I thought the very shortness of it showed Mary’s urgency to get her story out before what she feared befell her. A brilliant book that’s caused a lot of controversy because of the subject matter – but in the end I felt it was about love and guilt, and motherhood, more than it was about religion.